8 Types of Nouns Chart updates in the year of 2018, as per students interest, 8 Types of Nouns Chart 2018 designed and more nouns chart will be updated continue. How many types of nouns are in English grammar? Students give answer 8 Types of Nouns, yes, but it can define many types for example name of things or person. I does mean what you see that is noun. You spell anything with name is noun. 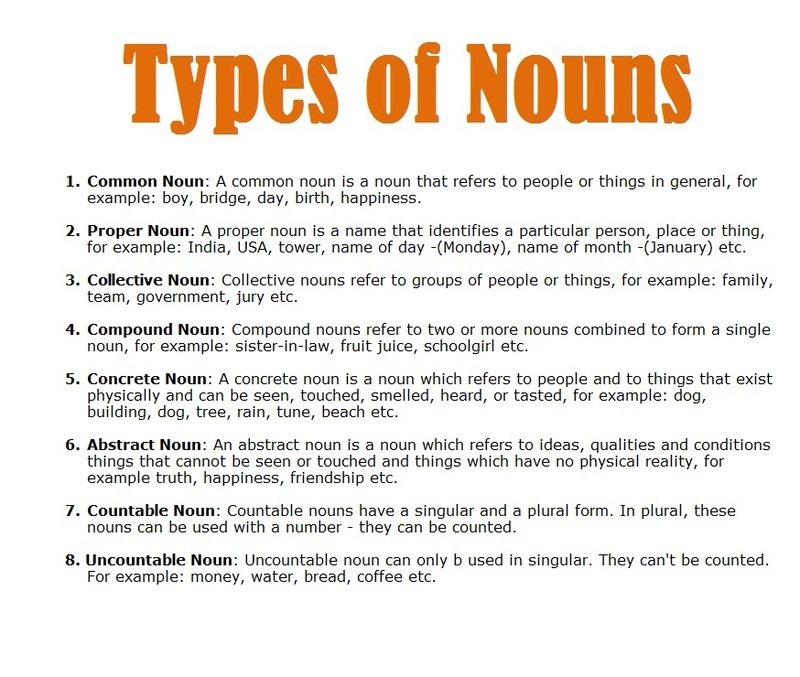 Nouns it very interesting topic should be clear, because noun topic is very important for students. Whole life it uses. Any question papers of examination contains noun questions in English grammar subject. Examination may be school or board or competitive. Noun question contains in exams. Things you can see, touch and feel, are noun. You read noun definition in books like this. Noun Definition: They are names of persons, places or things. But you can understand like this, anything you see, touch and feel. This is acquaintance of your mind. You name it. It is noun. My name is a noun. Your name is also noun, because you are visible. Anyone can see you, touch you. This rule applicable for all.